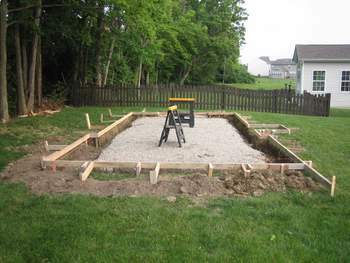 I'm planning on building a shed on a 22x12 slab. 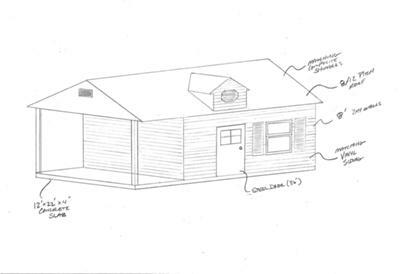 The shed itself will be 16x12 with a 6ft covered porch. I'm wondering about the trusses, should I buy or build them? I would like to get as much storage as I can, so if I bought them I would probably buy attic trusses. On the other hand, I've seen some smaller sheds built with trusses where there wasn't a board running from eave to eave, which definitely opens up the space inside. Although I'm sure these aren't as strong as a truss with a full cross-member running from eave to eave. Comments for Build or Buy Trusses?? But, I'm not here to avoid the? Here in the US.there are building codes. And this also factors into the way garages go up. In your situation, I would build rafters and put a collar tie on them all, as I assume 12' is the width.This will give you that open space that's desired. Definitely, use a ridge board. Which is the best of these 8 types of shed roof covering? So, the ridge board would run the length of the roof, with the rafters tieing into it on either side? Then a collar tie would run between each set of rafters? How close to the peak can I put the collar tie for a 12' roof? Do I need to use 2x6's for the rafters? 12" O.C. or 24" O.C.? Correct on the ridge running the lenght of the building,or beyond if there will be a gable overhang on both ends. Your collar tie adds strength to the rafters and simulates a truss.depending on the roof pitch.Just make the collars ties as long a you can while still keeping your space,Also they make for good storage of items up top. You have the pics here by the weekend right?? I'm still in the planning phases right now, so pics by this weekend is a stretch! I'll be sure to post pics when I get into everything. Thanks again. So I'm getting closer now. The slab has been poured/finished. 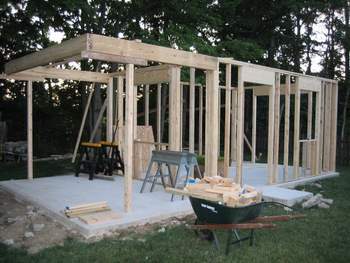 Plan on building the shed next week. I'm going to build the rafters out of 2x6's, 6/12 pitch. The span will be 11'8" (4" room for brick veneer on front ... yes, I said brick). I know this is a broad question, but how do I cut my rafters? Any good site that tells you how to use rafter tables/speed square, etc? Also, what goes up first? Should I cut all the rafters at one time? When do I tie them to the ridge beam and how do I hold it in place? How do I do the 1' overhang on each end? how do I post a pic to this discussion? I've got a few I'd like to share. Here is a selection of the photos you sent in. I would like to do a little feature on this and use all the photos you sent. Approaching completion - siding and trim to be added soon! Here is a suggestion. This was my first attempt at building a large project. 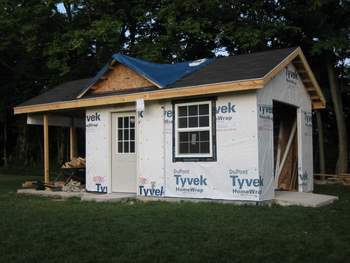 My shed, 12x16 is near completion did doors this past weekend and working on trim. My suggestion for supporting your ridge beam is to nail a 2x6 at each end of your shed wall in a verticle position. Cut a notch in the board so that your ridge board will fit in it. Make sure the 2x6 is supported. Then believe it or not you can put up your ridge board by yourself. I did! It will stay there during a storm. Couple of great sites for getting the angles you need. 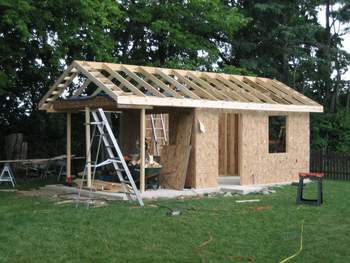 I know this thread is a bit old but I took a liking to the shed you built and decided I'm going to build mine pretty identical to it. Was wondering if you had any additional pictures of the build process that you could email to me. If you would be able to, let me know by replying to this thread.